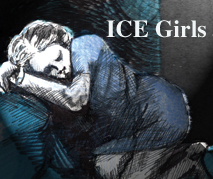 Ice Girls A new novel by Dan McLaughlin! Here the idea of using waifs to sell matches is born and brought to its first meeting. © 2008 Dan McLaughlin. All rights Reserved. Here is the Parable of the Prince and the Pea © 2008 Dan McLaughlin. All rights Reserved. Here is where investigative reporter Hans Christian Andersen confronts executives about freezing girls selling their products. © 2008 Dan McLaughlin. All rights Reserved. Click here for a download to a mpeg of the book where the waif idea is born and discussed on cd. © 2008 Dan McLaughlin. All rights Reserved. (4.67 mb). This just in! ICE Girls has been nominated as best Storytelling album (2009) by the incredibly perceptive people of Just Plain Folks! OK, that news out of the way, thanks to Hans Christian Andersen, you already know the story of the Little Match Girl who froze to death selling matches on a street-corner on New Year's Eve. But what about the managers who woke up the next morning (their day off!) to deal with the mess? How did the deal with the resulting public relations nightmare? How did they get in the mess in the first place? And, most importantly, how did they get out of it? The latest best-selling book by Dan McLaughlin, "ICE Girls: What Managers Can Learn from the Story of the 'Little Match Girl' by One Who Was There" is in the "tradition" of a self-help management manuals such as sacred cows make great burgers and moving the cheese to excite the mouse. "ICE Girls" introduces a metaphor that encourages managers to embrace the clown of adversity when one is unwillingly thrust into a pair of big red floopy shoes, and then to smile. What more COULD there be in a novel so slim (and cheap)? The Story of the Red Shoes from the point of view of the Deity who hacks off the feet of dancers. Not necessarily just a critique of modern dance. The Story of the Steadfast Tin Soldier from the point of view of the object of his adoration, the one-legged ballerina. What some call mute admiration others call stalking and harassment. The Story of the Emperor's New Clothes from the point of view of the frustrated revolutionaries who convince the Emperor to wear his new clothes in public. Hint, it does not turn out well for them. Available now as a book on paper and a book on CD and a book just on audio files! Only Write the Words that You Will Read. Stories are things that happen and are revealed through events, thoughts, direct evidence and conversations. Everything else, including almost all descriptions of places and things are words that can safely be skipped over no matter how beautifully written because they do not contribute to the story. This includes character descriptions including names. So don't bother writing them. As an added bonus, by leaving these thing unwritten, the reader is required to supply as much or as little detail for themselves in this area as they desire. This, theoretically, draws the reader into a more collaborative relationship with the text. Oh, and SpellCheck knows even less about grammar than Dan does. Dan has also assembled some of the greatest performers ever to come out of the Renaissance Pleasure Faire and the Pasadena Public Library to perform on the book on tape. Along with Dan, talents such as Mark Sellin, Clynell Jackson, Bailey Jackson, Tom Hubbard, Nick Smith, Marie Plug, Margit Schmitt, and Mike Schmitt bring to life such scenes as the marketing brainstorming sessions that consider using the maket segment "Urban Dregs" as sales consultants. The assorted fables are read by Margit in a sweet, soothing voice that carries with it just a hint of something that urges you to edge ever so quietly to the door. Mark's monologue on the importance of God in amateur talent shows is worth the price of the 2 vol. CD set alone. You will want to listen to it over and over again. What are those web sites again, Dan?